Bangkok sidewalks are some of the best in the world. I am not speaking of the quality of the sidewalk construction or the cleanliness- but about what you can buy on the sidewalks. I will shed my laziness and write about the street eats, but wanted to highlight the veggies and fruit you can purchase. For my few weeks I seemed to only notice the prepared food on the street- ready to eat on the sidewalk or take home. With the low cost of food on the street and many people having small and limited kitchens, many Thai people eat the majority of their meals on the street or buy food from a street vender to take home. An adjustment is required when you visit other countries- you must understand their food standards are very different from America. The cheese in the countryside of France, the meats of central European countries and how most countries serve a fish whole are just a few examples of how other countries deal with foods differently from North America; in addition, most other countries have other types of fruits, veggies and eat different cuts of meat. I have much more to write on this topic, but it is very simple- fresh food is not handled the same way in all countries and most other countries allow more rustic forms of transport to get fresh food to market directly from the grower or source. The packaging isn’t always fancy, but the food is fresh and great. 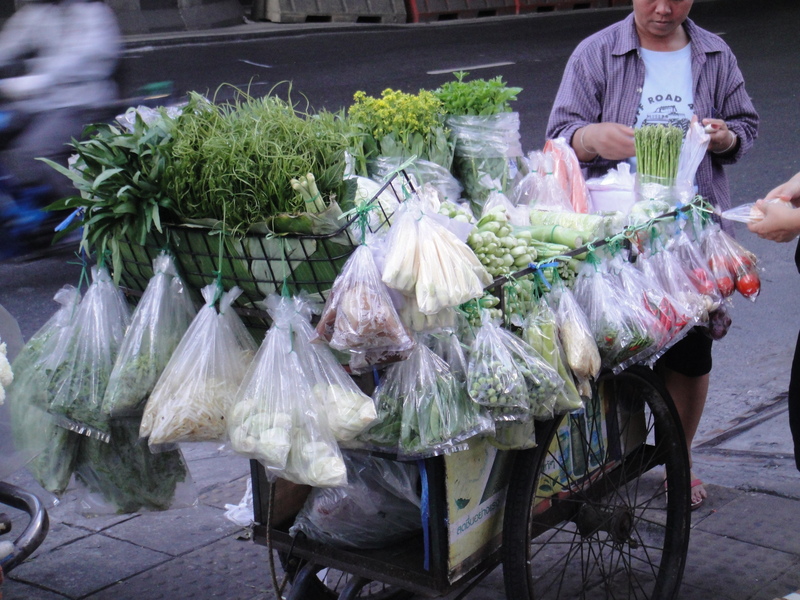 I went for a walk late this afternoon and saw the lady in the picture selling an unbelievable assortment of veggies out of her mobile cart on the sidewalk. Wow, this on the side of a busy road in the middle of a city of eleven million people and a three minute walk from my apartment. Two minutes later, walking past an entire assortment of other venders with various cooked food, and I found a man selling these great looking apples. 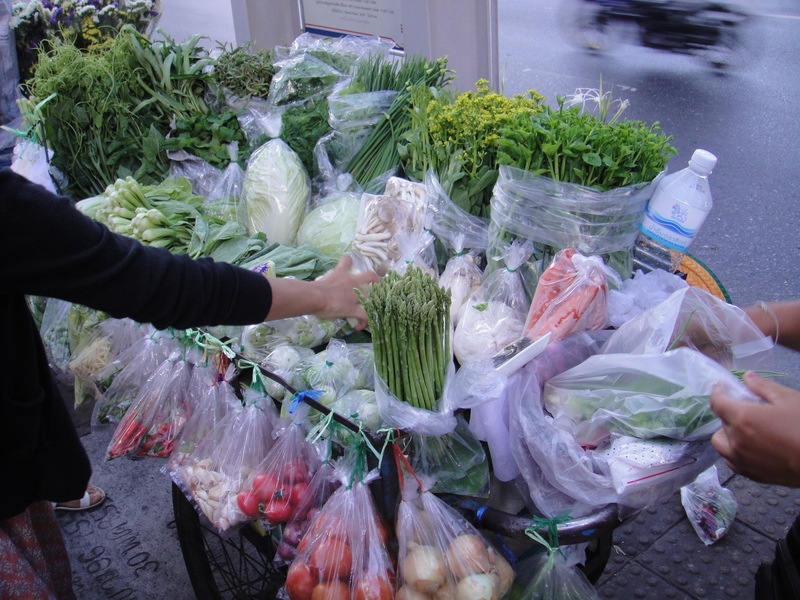 A fun part of the food available on the sidewalks- the venders that sell much of the fruit, veggies and flowers are constantly moving. ; many of the sidewalk prepared food venders setup on the sidewalk in the same place each day and do not move during the day. As you can see from the woman selling the veggies, her cart is on wheels. After some time in one spot, she will just wheel her cart out into the street and push it to a new spot. Yes, into the street; the sidewalks are narrow, cracked, uneven and crowded to venders just push their carts in the street, staying close to the sidewalk. 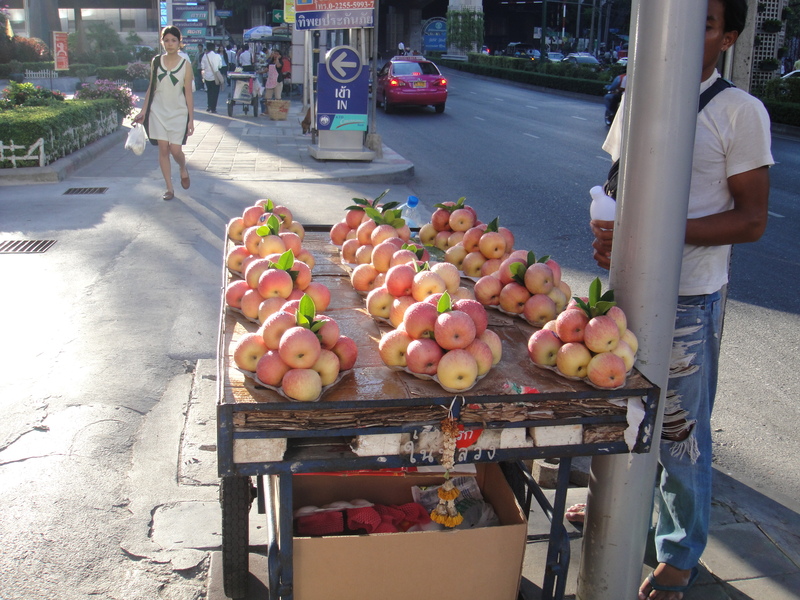 Part of the fun and culture of Bangkok is the ability to see the commerce of the street venders and small shops. Coming from California, I was used to seeing fresh food, fruit and veggies at farmers markets, but never on carts wandering around town and parking on sidewalks throughout the city. This entry was posted in Bangkok, Culture, Food & Restaurants, Sightseeing, Thailand. Bookmark the permalink.